IP-intensive industries accounted for about $5.06 trillion in value added, or 34.8 percent of U.S. gross domestic product (GDP), in 2010. Merchandise exports of IP-intensive industries totaled $775 billion in 2010, accounting for 60.7 percent of total U.S. merchandise exports. Wow. Sounds impressive. But where do these numbers come from? It turns out, the government has shamelessly ramped up the employment numbers by including a very liberal definition of IP-Intensive industries. To follow appreciate how liberal, it is useful to spend some time on Table 10, which is found on pages 36-38 of the report. Indeed, before you read the whole report, spend 10 minutes reading Table 10, and then things will begin to make more sense. More than 83 percent of all reported IP-Intensive jobs come from the trademark sector, where the mere existence of a brand name somewhere in the value chain makes the industry count as “ip-intensive.” Most of the jobs have nothing to do with anything remotely connected to ACTA, SOPA or other IP policy debates. Only one of these, Computer systems and designs, can honestly be described as an IP-intensive industry, in the sense that the Congress is seeking to understand the relationship between IP and employment. These are just a few of the industries the Department of Commerce calls IP-Intensive: Oil and gas extraction, Residential building construction, Grain and oilseed milling, Dairy product manufacturing, Lessors of real estate, Gambling industries, Household and institutional furniture, Pulp, paper, and paperboard mills, Sporting goods and musical instrument stores, Travel arrangement and reservation, etc. Industries like these overwhelm the statistics on jobs for the more legitimate choices, such as Sound recording industries (just 36.4 thousand jobs), or Software publishers (259.8 thousand), making it seem as though the IP-Intensive industries are truly enormous employers. And, when you look at an industry like Sound Recordings, you have to ask, why is US trade policy so responsive to an industry of just 36 thousand jobs, and hostile to the massive and wealthy technology sector, that is the target of SOPA, ACTA and other IP enforcement initiatives? During the presentation of the report, the USPTO was asked about the impact of intellectual property policies on the information sector: “if you cut the term of patent protection in half, from 20 years to 10 years, would that increase or decrease the number of jobs in the information sector of the US economy?” USPTO said it could not answer that question. It was also pointed out that while the Software publishing sector was a high wage sector, it was a relatively small employer of the professionals in its key occupations. 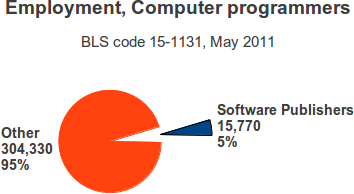 For example, less than 5 percent of computer programmers work for Software publishers. What do the other 95+ percent of computer programmers do? Quite a few build applications and services than use various open source free software platforms, which are both inexpensive and easy to customize. And, where is the growth for employment? 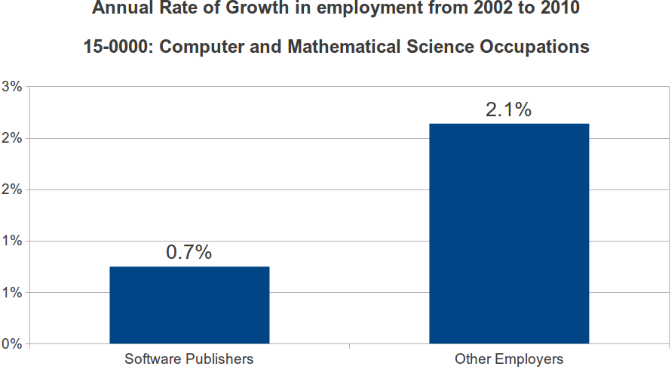 For the computer, mathematical science occupations, the rate of growth is three times higher outside of the Software Publishers Sector than inside the sector. So what can USPTO or the Economics and Statistics Administration tell us about the relationship between IP and employment? Not much, other than grocery stores, insurance companies and oil companies use a lot of trademarks, and not many people work in the sound recording industry. After we left the TACD plenary where the IP and employment report was discussed, the TACD IP Policy Committee met with four US IP/Trade agencies, and three Directorates of the European Union. The meeting began with a US trade official telling us about this new employment study that showed the need for ACTA. No kidding. And, we will certainly continue to hear about this report, with very little understanding of how it was put together.